Gosh I miss having wifi! It is being installed on Friday though, thank goodness. I want to blog from the comfort of my sweatpants, no makeup and messy hair! Is that too much to ask? Anyway, I wanted to do an update in regards to a big move I decided to make with my meal plan and training plan. As seen here on blog, I have been working with my coach Michelle for about 4 months now. I will just say it, I have decided to stop working with her. It is nothing against her. She is great and people see amazing results with her! But I want to explain why I have made this choice. It is due to something that I haven’t mentioned too much on my blog or Youtube because, quite honestly, I have felt rather embarrassed and nervous to talk about it. I have come to the realization that many people struggle this situation and I thought it would be good to address it. If you have seen my bio, either on my blog or through my videos, you will have seen that I was always an athlete. Exercise is something I have always been very passionate about and that is still true today. However, I was overweight and matters only got worse after my first year at university. I have always explained it was because “I didn’t know much about healthy eating,” but only part of that statement was true. Really I struggled with binge eating. I now know what situations bring out the “I wanna binge” feeling and this is the main reason why I stopped working with Michelle (again, its not because of her!). Personally, the planned out concise meal plan did not work for me. It brought out the binge eating tendencies. Now don’t get me wrong, I haven’t gained weight from the many binges I experienced in the past four months. I have maintained part of the weight I lost in month 1. I just feel this was the best step for me. What I needed was balance. The one cheat every two weeks was not cutting it for me. Also, the fact it was suppose to be a clean cheat. After having beef flank every single day for a month, the last thing I was craving was a beef steak! Again, nothing against this way of eating, it is just not for me. As a certified trainer and coach, I believe self development is extremely important. I have been studying, reading and learning more about weight lifting, gaining muscle, fat loss, nutrition, and so on. I have come to the realization that much of what I want to accomplish I can do on my own for the time being. I may hire someone, locally, when I get into show prep (because lets be honest, AWKWARD Jenn posing for her show needs to be slightly less awkward!). For now, I am okay to do my own thing. Also, I am working on my fitness business to get it up and running in the next year or so. I have many big ideas and dreams but the main plan on is to train clients locally as well as online. So I am planning on being a guinea pig for the workouts I am putting together as well as trying out a new way of eating. As you may have noticed, I am an Instagram-aholic! I had noticed the hash tag #IIFYM all over the place and thought… “what is it with people and acronyms? !” ….just kidding. I was actually very curious and did a fair bit of research. IIFYM stands for “If it fits your macros.” This is my “new way of eating” that I found. I have been using this method of eating and honestly, I am eating clean 90% of the time and still enjoying food I love! I am finally feeling BALANCE again and have no urge to binge. What else? I am seeing improvements in my energy levels, more power in my workouts and changes in my body! Not too shabby if you ask me! So that is a not so brief run down of where I am at now! I still have plans to compete and gain muscle, I just will be working towards those goals with my own knowledge and planning. Since I have been officially DONE undergrad since April 22nd, I have taken the past few weeks to have a bunch of time to myself to reflect, read and renew myself. I have been thinking a lot about what overwhelms me most and how to overcome that. I will be upfront to say I have gained a bit of my weight back, about 10 lbs, and it has made me feel pretty frustrated, annoyed with myself and unhappy. I have experienced some extreme “self love” emotions to extreme lows of “self hate” for my body image in the past few months. It’s exhausting. So I took these “personal development” days to step back and reflect on what to do from here. I realize that I have a habit of looking too far ahead and not embracing myself and the moment. I am happiest when I live in the moment. When I leave my worries of what could happen if I take this or that risk behind, I find I am freed. I looking too far ahead of where I am right now to be somewhat destructive as it makes me feel overwhelmed and almost “not good enough” to carry on. So what I have decided to do is step back and embrace each step for its ups and downs. From time to time, look bad to admire the battles I have fought and move forward with new ones. 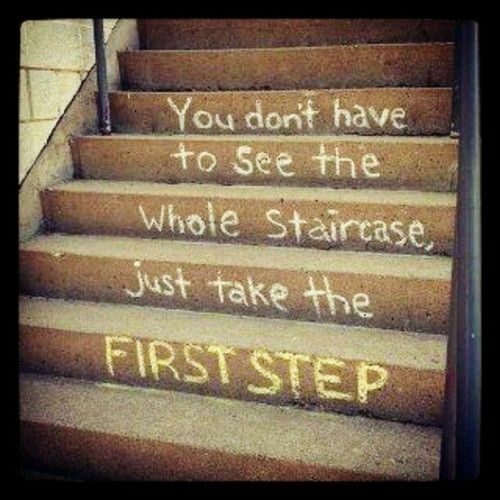 You don’t have to see the whole staircase, just take the first step. This was an idea I followed when I started my journey in 2009, and I found a way of losing grip of that idea. One step at a time. I need to focus on each step in order to move forward and feel at ease. I know I am a high anxiety and high stressed individual, so this is what works best for me. 2013 Resolutions? Nah, 2013 GOALS! 2012 gone in a flash! Am I right?! So I don’t know about you all, but I am a HUGE goal setter. I set goals for the year, the month, the week, and even every day. (post-it notes and highlighters are my best friends….yeah I don’t get out much. HUSH!) 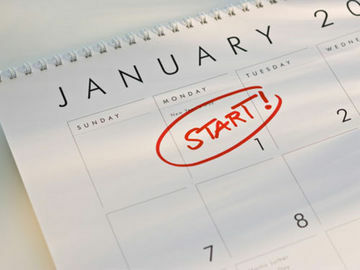 So why is it that when January 1st hits goals are now named “resolutions”? (I googled the history of New Year’s Resolutions, if you are interested here is a neato article!) I think what baffles me most is the idea of “I will start on January 1st.” Kind of like my old excuse of “I’ll start my diet on Monday” since it was the start of the work/school week. The final time I joined Weight Watchers and began my weight loss journey it was NOT a Monday, it was a WEDNESDAY *gasp*..yet I was successful?! CRAZY TALK! 😉 Why start later when you can start now? everyone has to start somewhere right? (I am all about the tough love if you can’t tell). Why was my 2012 so successful? I personally believe that you should write your goals down in a place you can reference. My daily goals? (HELLO POST IT NOTES!) I stick them in my planner! Sometimes I will even post them to my bathroom mirror if I need a SPECIAL reminder (ie: Be kind to Jenn today – sounds corny but I can be my worst critic!) I also categorize goals into things like Fitness, Self/Well being, Relationships, Financial, School, Business and so on. Not only should you write them down, but write down what your first step of action will be for that goal! I am not saying write an entire game plan, just write down your first step. Once that is done cross it off and write down your next step. Step One: I vow to do cardio for at least 30 minutes four times a week and add more colour to my plate (AKA veggies/fruit). So yes. I believe goal setting is one of the most important keys to success. I am sure we have ALL heard of the S.M.A.R.T acronym (specific, measurable, achievable, realistic, time-targeted) and I believe this is important. It is so easy to get overwhelmed, especially when it comes to weight loss, muscle gains, training for a race, ANYTHING. Don’t be one of those people who are going hard at the gym and then we don’t see you once March has come. This is a lifestyle. Your body was meant to move and be nourished. If you are having a day where you are finding it hard to get to the gym or go for a run make a mini-goal for yourself. This was a tactic I used on myself when I was just beginning to get active again. “Jenn, move for at least 30 minutes..if you STILL don’t want to do this you can stop.” If you think about 30 minutes is really not that long, in fact most of our favorite TV shows are that long! Why not do jumping jacks/burpees/pushups/squats/lunges/WHATEVER while you watch your TV show? Pretty manageable if you ask me! Happy New Year everyone! Let’s make this one the best year yet!! I challenge you to write down your goals and course of action!